In January, the development team made progress on the foundation of new Fundraising Suite events. We held our first internal team demo of the new event registration and checkout flows. There were a lot of gasps, “oohs,” and “ahhs” in the two-hour demo. We’re far out from any major reveal, but stay tuned for sneak peeks. This “first light,” as our development team calls it, is a culmination of months of research, interviews, design sprints, and user feedback. A design sprint’s aftermath includes lots of stickies and whiteboard drawings. We heard you: you pop into your campaign Email Tab and aren’t quite sure what to do. There’s a lot in there. So, we overhauled the navigation and added two onboarding cards to guide you in the right direction. Set your campaign’s global email theme with your brand colors and logo, so you don’t have to spend time adding them to every email you need to customize. 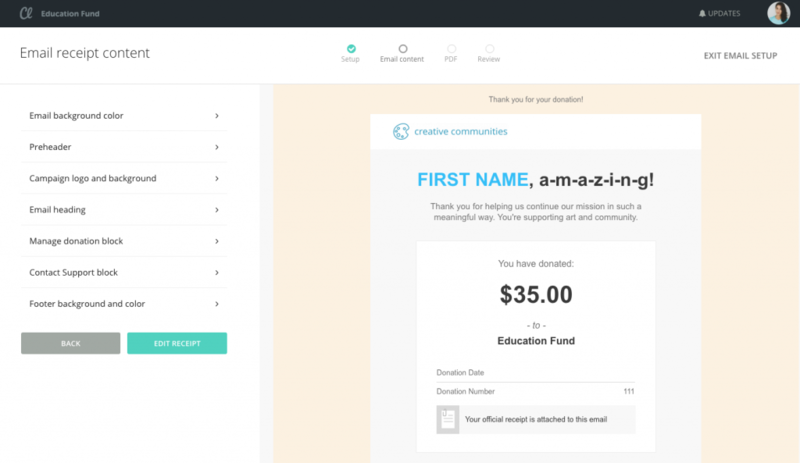 Next, customize your donation receipt. Donation receipts don’t have to be boring. They’re excellent opportunities to say thank you or reiterate a gift’s impact. The Email Tab overhaul also includes new additions. Most notably, you can now drill into important email engagement metrics like opens, clicks, and bounces. We recommend pairing Classy’s email capabilities with email marketing best practices. Get started with our downloadable guide, a Beginner’s Guide to Email Appeals for Nonprofits.